Ohio Fortis Energy Services is reaching out to local residents, community groups and area businesses to help supply toys to needy children in North Central West Virginia during this holiday season. “This is a great opportunity for Fortis to give back to our community and put a smile on the faces of children throughout our area of operation,” said Mike Newman, Regional Sales Manager for Fortis Energy Services. Mike will be accepting new, unwrapped toys for children up to age 17. 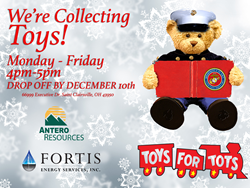 The toys can be dropped off between 4-5PM at the Fortis Energy Services Regional Headquarters at 66999 Executive Drive in Saint Clairsville, OH 43950. “Fortis is proud to help make a difference in the lives of less fortunate children in our area of operation and proud to stand with Antero Resources and the Marine Corps Reserve who work very hard to make certain that Toys for Tots is a success,” said Mike. Toys for Tots embodies the true Spirit of Christmas. The gift of a shiny new toy to a needy child, something that most children take for granted, means that someone cares and that child is not forgotten.